The event will take place during Easter Week from 19th to 20th of April in Zamna Tulum. Besides an excellent musical programme formed by more than ten renowned artists, the festival will also have a street market, several chill out areas and accommodation and transfer packs to enhance the audience’s experience. 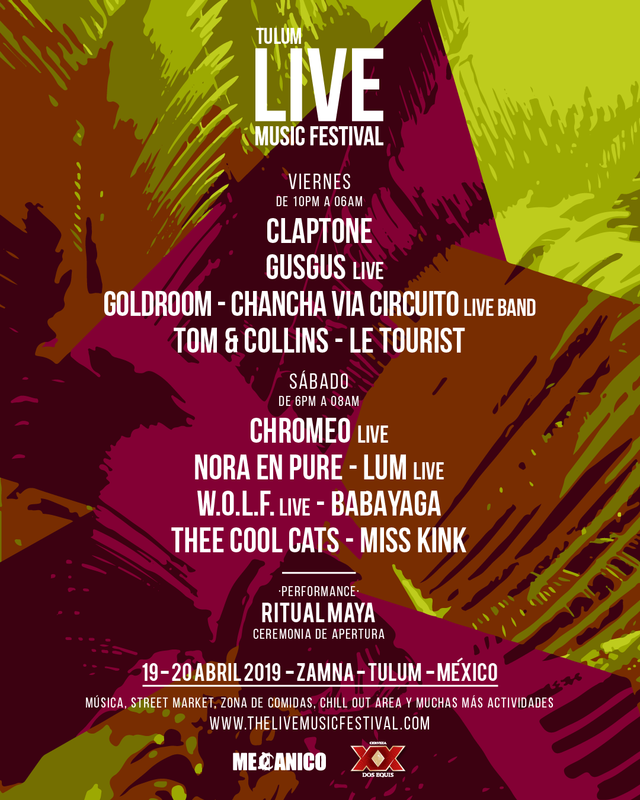 A few months ago, the birth of Live Music Festival was announced, an event that once again makes the Mexican Caribbean an unavoidable destiny for the Latin American music scene. The first edition will take place 19th and 20th of April in the idyllic spot of Zamna Tulum with live performances from renowned international artists. But that is not all because Live Music Festival will also have an excellent street market, several chill out areas as well as accommodation and transfer packs to enhance the audience’s experience. Le Tourist, the resident DJ that never fails. Also known as Fernando Duthoy, this artist has earned his spot in the Mexican electronic scene thanks to his residences at clubes as iconic as Mamitas Beach Club and La Santanera. LUM Live, spirituality in electronic music form. The Argentinian Sebastian Gandine who is based in Tulum lived a close death experience and since then he tries with his music to recreate that sort of fatal but yet beautiful adventure in which he went through his subjectivity and penetrated into what he considers as his true essence. W.O.L.F. Live, the most ferocious electronic music. Charlie Juarez was dedicated to music for many years but he moved to Montreal to fall in love with electronic music and founded Infinite Machine, which is nowadays one of the most influential labels in the world. His potential and ferocity as a DJ and producer make of him a current artist to take into account. Miss Kink, pure Mexican talent. Rhodesia, Mono, Bar Oriente, La Salsanera, Diablillo… There hasn’t been a club in Mexico that Miss Kink hasn’t managed to dominate with her particular fusion of Nu Disco, Funk and House making of her sets unique moments. Currently besides her facet as a DJ and producer she is resident of the Selina hotels and owner of her own label Gomme Records. Babayaga, an Italian house icon. If there is a key figure in the Italian electronic music scene, that is without hesitation Babayaga, creator of the iconic party Syncopate, producer of hits and owner of one of the most energetic, eclectic, passional and contagious live sets in the industry. Behind its organization we find the prestigious brand Feria Trendy, an independent design and art fair with great experience in the field. Natural therapies, jewelry, clothes, handmade items, new trends, etc., the best autochthonous designs will have a place at Live Music Festival with projects such as Boox and Saak, Lika Tulum, Tuluminati, Cotiledón, Magnolia Corseterie, Conscious Convergende, Vida Zen and La Galería Tulum. The same and special dedication that Live Music Festival has put into the design of its music programme has been put into the creation of different and special chill out areas on the beach in which the audience will be able to rest. Besides this, during the two day festival, together with the music performances the audience will be able to enjoy different performances such as the splendid show that Ritual Maya, escenic arts, theatre and dance company will offer as the festival’s Opening Ceremony. Senses, a brand created by Voiash: the turism leader company in USA, Mexico and Latin America has been in charge of developing an exclusive series of packs for Live Music Festival that will enhance the audience’s experience. You can enjoy two nights of accommodation in a double room, transport from the airport to Tulum to the festival and vice versa, and entrance to the festival for the two days. You can enjoy three nights of accommodation in a double room, transport from the airport to Tulum to the festival and vice versa, and entrance to the festival for the two days.